PRICE REDUCED to $199,900! Fantastic location near Tatnuck Square! Perfect for a single, a couple or a small family, or those just starting out or downsizing. Private setting on a dead-end street, requiring limited ongoing yard work. This cozy and charming Bungalow is nestled on a quiet 0.29 acre wooded lot and has 2 to 3 bedrooms and 1.5 baths. It is just 1.6 miles to Worcester Regional Airport, is within walking distance of Worcester State University and Tatnuck Square shops and restaurants, and local parks. Offers 1,593 +/- SF of living area, with an additional 910 +/- SF in an unfinished basement. Hardwood floors and updated windows on 1st and 2nd levels; large living room with working fireplace and bluestone hearth; 1st floor bedroom (currently used as dining room) and full bath; large 2nd bedroom, 3rd bedroom and half bath on 2nd level; bright 4-season porch/bonus room in front. Updated dishwasher and range (2012) in eat-in kitchen; oil-fired forced hot air heat with updated high efficiency boiler and water heater (2014); updated roof (approx. 2008); window A/C. 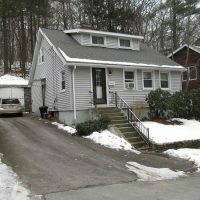 Detached stone/brick garage with storage space; driveway with 4 parking spots; detached wood deck overlooks wooded area. Come see for yourself!